When a tomato plant wilts, it can leave gardeners scratching their heads, particularly if the tomato plant leaves wilting happened quickly, seemingly overnight. This happening leaves many wondering, “My tomato plants are wilting, why?” Let’s take a look at the possible reasons for wilting tomato plants. The most common and easily fixed reason for wilting tomato plants is simply a lack of water. Make sure that you are properly watering your tomato plants. Tomatoes need at least 2 inches of water a week, provided either through rainfall or manual watering. If your tomatoes are well watered and seem to wilt more after being watered, then chances are your tomatoes are being affected by a fungal wilt. Fungal wilt in tomatoes is caused by either Verticillium wilt fungus or Fusarium wilt fungus. The effects of both are very similar, in that tomato plants wilt and die rapidly as the fungus clogs the vascular system of the tomato plant. It can be difficult to determine which fungus is causing the wilted tomato plants. Another fungal wilt of tomatoes is Southern Blight. This fungus can be identified by the appearance of white mold on the soil around the base of the plant, in addition to the rapid wilting of the plant. Unfortunately, all of these fungi are untreatable and any tomato plants wilting due to these fungi should be immediately discarded and you will not be able to plant any nightshade vegetables (like tomatoes, peppers and eggplants) in that area for at least a year, possibly two years. 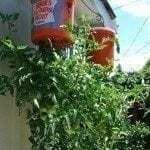 You can, however, purchase tomato plants that are resistant to both Verticillium wilt fungus and Fusarium wilt fungus if you find that you have a continued problem with these fungi despite rotating tomatoes to new areas in your garden. If your tomatoes are wilting and the leaves also have purple or brown spots, the tomato plants may have a virus called spotted wilt. As with the fungi listed above, there is no treatment and the wilting tomato plants should be removed from the garden as soon as possible. And, again, you will not be able to plant tomatoes there for at least a year. Though less common than the other reasons listed above for wilted tomatoes, Tomato Bacterial Wilt can also cause a tomato plant to wilt. Often, this disease cannot be positively identified until after the tomato plants have died. The tomatoes will wilt and die quickly and when the stem is inspected, the inside will be dark, watery and even hollow. As above, there is no fix for this and affected tomato plants should be removed. 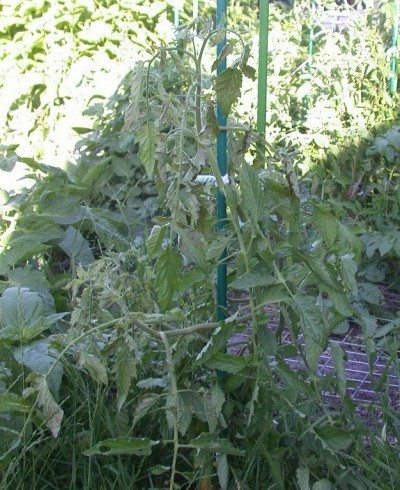 If you suspect that your tomatoes have died of Tomato Bacterial Wilt, you may want to solarize the affected bed, as this disease can survive in many weeds and is difficult to remove from beds, even if they are left unused. Some uncommon tomato pests, such as stalk borers, root knot nematodes and aphids, can also cause wilting. Also, planting tomato plants near allelopathic plants such as black walnut trees, butternut trees, sunflowers and tree of heaven, can cause wilting in tomato plants.